Our latest BP Award Guides spent their adventure weekend by the sea in Criccieth. Ten guides from units across Shropshire took part in their Baden Powell Adventure weekend. They arrived at Shrewsbury train station on Friday evening to set off for a mystery destination. After a long train journey filled with activities to get to know one another, the girls arrived to spend the weekend at Ynysgain, which is a Girlguiding campsite next to the sea in Criccieth. 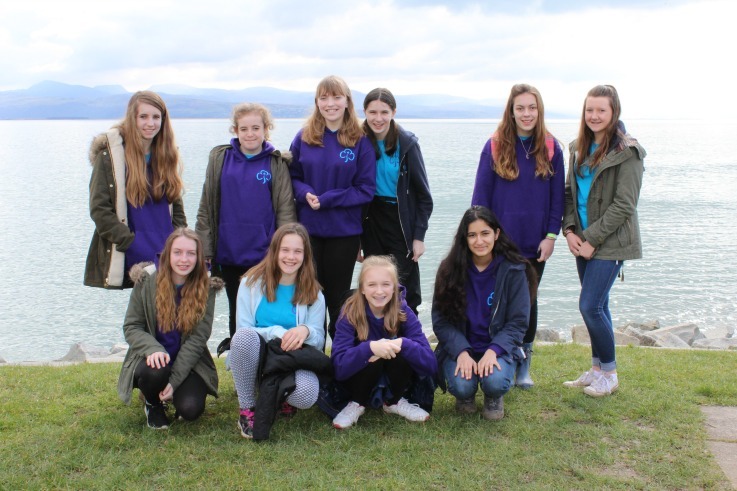 On Saturday, the girls spent the afternoon litter-picking along the coastline from Criccieth to Ynysgain beach, as part of the Clean for the Queen initiative organised by Keep Britain Tidy. They also collected items to use for seaside-theme crafts later in the weekend. Saturday evening was filled with fish and chips, alternative ice skating and learning about the opportunities Senior Section has to offer. On Sunday the sun was shining, and the girls walked to Criccieth for a visit to the RNLI station, then stopped for ice creams before catching the train home to Shrewsbury for their award presentation. Congratulations to all of the girls on achieving their Baden Powell award. To sign up for your future BP adventure weekend, please see the events page.